A developer is paying Volusia County $1.8 million to help widen a mile of Williamson Boulevard — a deal county leaders and prominent developers say should silence critics who question whether builders pitch in enough for roads when mega-growth comes to town. Such deals, known as proportionate share agreements, are but a slice of a road-funding pie that has been shrinking over the years — to the point that the county and its 16 cities are looking to ask voters in November for a half-cent sales tax to boost funding. Government officials say they need the extra money because of dwindling gas tax revenues at a time when new growth is straining Volusia’s network of roads. But they’ve been getting pushback from some residents who, before they ante up with a higher sales tax, want to know that developers benefiting from that new growth are paying their fair share, too. The County Council in February decided against increasing road impact fees on new development — another slice of that road-funding pie. At the time, county officials said the reasons for pursuing a sales tax hike but not an increase in impact fees were too complicated for most residents to understand. Afterward, a Feb. 25 News-Journal report showed that many neighboring counties charge developers higher rates than Volusia in road impact fees, and many counties across the state have increased rates as construction costs have gone up. A national expert called Volusia an “outlier” because the county hasn’t raised its rates in 15 years. In response, county officials said proof that developers are paying their way could be found in proportionate share agreements, also known as “prop share,” a deal that County Manager Jim Dinneen told council members “stays under the radar” in the debate about the county’s impact fees rates. Developers of the Woodhaven housing community in Port Orange paid about $300,000 for a nearby traffic signal as part of a proportionate share deal with Volusia County. Such payments are intended to help keep approved developments moving forward. Developers who pay them are entitled by law to impact fee credits equal to what they pay, so they are not paid on top of impact fees. Which is true — to a point. In response to a News-Journal request for a list of proportionate share projects since 2013, the county cited the $1.8 million Williamson Boulevard widening; about $300,000 for a traffic signal paid by ICI Homes, the developer of the Woodhaven housing community in Port Orange; and $52,000 for improvements to Saxon Boulevard paid by the developers of the 1,000-home Parc Hill development in Orange City. But the money — which helps ensure that developments move forward on schedule with the necessary infrastructure — isn’t paid on top of impact fees. Developers who pay into a proportionate share agreement are allowed to save on the impact fees they owe. Or they can earn credits they can sell to other developers so they can save, explained James Nicholas, an impact fee consultant and professor emeritus of urban and regional planning and law at the University of Florida. And because Volusia’s impact fees tend to be lower than other counties and haven’t kept up with the rising cost of construction, the county isn’t generating as much from that source of revenue as other local governments, Nicholas noted. Yet County Council members continue to defend existing policies or dismiss the debate as one that’s too complicated for critics to understand. With voters likely to face a question of whether to adopt a half-cent sales tax hike for roads an infrastructure, The News-Journal is devoting “many, many inches” of news space to take a closer look at the relationship between impact fees and proportionate share agreements. Volusia County funds road construction from a few sources — those slices of pie mentioned earlier. The biggest slice is from gas taxes. Every time you fuel up in Volusia, the county gets 12 cents per gallon. The county collected $24.7 million in gas tax revenue in 2017. That revenue stream dipped significantly after 2007 and remained flat until around 2014. That seven year-span, during the Great Recession, amounted to an estimated $14 million reduction in gas tax revenue. In 2015, the revenues began to slowly increase. The 2017 totals are about only $1 million more than they were in 2005. The problem with gas tax money is that as cars become more fuel efficient, motorists are gassing up less frequently — and the county gets fewer dollars for its roads at a time when road construction costs are higher. For example, the cost to construct one mile of a two-lane urban road is roughly $4.8 million, according to figures provided by the county. To widen an existing two-lane road to four-lanes is roughly $5.1 million per mile. These estimates assume the county owns adequate right-of-way to construct the road to include stormwater management. These estimates jump significantly if the acquisition of land is required or environmental issues are encountered. To help make up the difference, the county and its cities have been discussing for years the possibility of a half-cent sales tax. If approved by voters, the extra sales tax money could generate $45 million a year, with the county getting close to half that and the cities dividing the rest based on population. Last year, a group of city and county leaders collectively identified $1.4 billion in infrastructure shortfalls. Another slice of the road construction pie comes from impact fees, which, unlike the gas tax, is set by counties and cities. Volusia County has collected roughly $14.7 million in road impact fees since 2013. Impact fees vary widely in Florida. Some counties, like Flagler, don’t have them at all or haven’t reinstated them since the recession. The fees are charged by local governments to help defray the cost of growth’s impact on services such as roads, schools and parks, among other things. 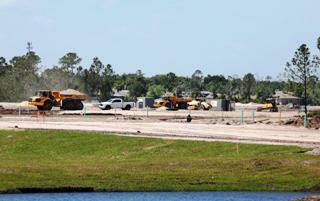 In Volusia, developers pay fees for roads, parks, fire services and schools. Because of the push for the half-cent sales tax to boost transportation needs, this story is focused on road impact fees. Fees vary widely among local governments and among different property types. A list of Volusia’s different fees is part of a 24-page document. The differences make it challenging to compare one county with another. Perhaps the easiest example is to compare the road impact fees charged for new single-family homes. Volusia assesses a flat rate of $2,179 for new house, regardless of its size or cost. By comparison, Brevard County charges $4,353 for each new home. Many other counties, including Seminole, Lake, Orange and St. Johns counties charge different rates for each house, depending on size and location. St. Johns County, which approved changes to its impact fee structure on April 4, charges road impact fees between $4,133 (for a home under 800 square feet) to $8,974 for homes larger than 5,000 square feet. A home of just over 2,500 square feet pays $7,337 in road impact fees. Manatee County, which has a median income similar to Volusia’s $41,000 mark, charges 20 different amounts for a new single-family home, ranging from $1,896 to $8,587. Although impact fees are not popular with the development industry, “They are an excellent tool when designed and employed correctly,” said Timothy Chapin, dean of the College of Social Sciences and Public at Florida State University. The Volusia County Council cut short a discussion over raising impact fees in February by dismissing the subject as too complicated to explain. In a follow-up discussion at its March 6 meeting, council members muddied the waters by suggesting proportionate share component was a source of funding above and beyond impact fees. Proportionate share “was never intended as a funding source for transportation,” said Jon Weiss, director of development services in Orange County, which generated $30.2 million in transportation impact fees in 2017. By comparison, Volusia County collected $14 million in road impact fees over a five year period between 2012 and 2017, records show. Developers who enter into a prop share agreement are entitled by state law to impact fee credits equal to the amount they pay, said Clay Ervin, Volusia’s director of growth and resource management. That means if the prop share amount is less than what the developer would pay in impact fees, the developer gets a discount. If the prop share amount is more than the impact fee charge, the developer gets impact fee credits to sell to other developers who come into the area. In the case of the Williamson Boulevard widening project, the $1.8 million paid by North American Development Group was nearly equal to what the developer owed in impact fees, said Mark Watts, a land-use attorney with the Daytona Beach firm Cobb Cole who represents the developer. Now the developer will get impact fee credits, meaning the county isn’t seeing any extra road revenue from the deal. Impact fees haven’t been successful in generating a consistent revenue flow for roads in the past. Some say it’s because they haven’t increased in so long. But the revenue earned has also gone into paying back a bond. In the early 2000s, during an economic boom, the county took out a $65 million bond to expedite needed road projects — like improvements to sections of Williamson, Howland and LPGA boulevards — changes that officials say paved the way for the Trader Joe’s distribution center and the Tanger Outlets mall. They expected to pay the bond back with what was then a steady stream of impact fee revenue. Then the recession hit and revenues tanked. In the end, the county has spent $13.4 million of its $14.7 million in impact fees revenue since 2012 on debt services. That leaves about $1.2 million for roads, and the bond money is running out — leaving county leaders focused on a potential push for a sales tax boost as a new revenue source. Given the nature of the prop share agreements, some national experts aren’t buying Volusia’s assertion that they compensate for impact fee rates that haven’t been adjusted in 15 years. Arthur Nelson, a professor of planning and real estate development at the University of Arizona who has authored college textbooks on impact fees and proportionate share, notes how much the cost of construction has increased since the fees were last increased. If they aren’t? “It may fall further behind because (proportionate share) is based on current (construction) costs, while impact fees are based on older, lower costs,” he wrote. Joseph Little, a professor who teaches government and tax law at the University of Florida, wasn’t familiar with specific conditions in Volusia and didn’t wish to comment on them. But he did speak to the history of fees and how difficult it can be for local elected officials to determine where the bulk of revenue for infrastructure needs should come from. Should it be through a tax initiative aimed at residents and tourists who use the roads every day — or higher impact fees aimed at developers who build around them? So how does it get decided? Campaign finance records show some of the most generous contributors to local political campaigns include homebuilder Mori Hosseini; beachside landowner George Anderson; officials with Consolidated-Tomoka, the land holding company that sold the property for major projects like the Tanger Outlets and Latitude Margaritaville; and officials with International Speedway Corp., which developed One Daytona. When asked about proportionate share agreements and impact fees at his spacious office at ICI Homes, Hosseini spoke of how development fees can affect the quality of life for young, married couples with low incomes and a newborn baby. His goal, he says, and the main reason he’s so involved in local politics, is to make Volusia County the best place to live and work. Impact fees play a factor in that, since those costs are transferred to the home-buyers. “The biggest investment that a young family makes is buying a house,” he said. “That’s the dream. That’s the American dream. If you add on $1,000 to impact fees, that does take some people out” of qualifying for a loan. “Make no mistake about that. Yet many of the counties with impact fees higher than Volusia’s have experienced more rapid growth in recent years. And many of the new homes being built in Volusia are marketed either exclusively or primarily to retirees. Hosseini says he isn’t against impact fees altogether. Developers, he said, should have to pay for infrastructure, and that’s why he supported impact fees in the mid-1980s when Volusia County first implemented them. A lot of the criticism toward the county’s impact fee rates has to do with timing. In November, voters will be asked to decide if a half-penny sales tax increase should be levied to provide cities and counties a new stream of revenue for roads, stormwater improvements and flood control measures. Those are items that developers put money toward through impact fees. But looking at it another way, developers also pay sales tax for all materials they purchase.